The Royal Cornwall Show 2018 was a highly anticipated year for Cornish Cider Makers as it marked the introduction of the first Cider Championships in 200 years where Cornish Orchards Dry Cider was recognised as the Gold Winner within the ‘Open Dry Class’. The Cider Championships, which were held at the Cornish Cider Bar ‘The Dreckly Inn’, was the first cider competition held at the Royal Cornwall Show in 200 years. Committee member, Cornish Orchards Founder, Andy Atkinson and Customer Care Manager Amanda Stone have worked for several months with the team at the Dreckly Inn on planning and orchestrating the new Cornish Cider Bar ready for the show. With the glorious weather, the bar was a huge draw during the show. There were around 50 types of cider from around the UK available for visitors to sample alongside this year’s Cider Championships which were entered prior to the event and judged on the first day of the show. There were eight classes in total that were open to enter for both hobbyists and professional cider makers. 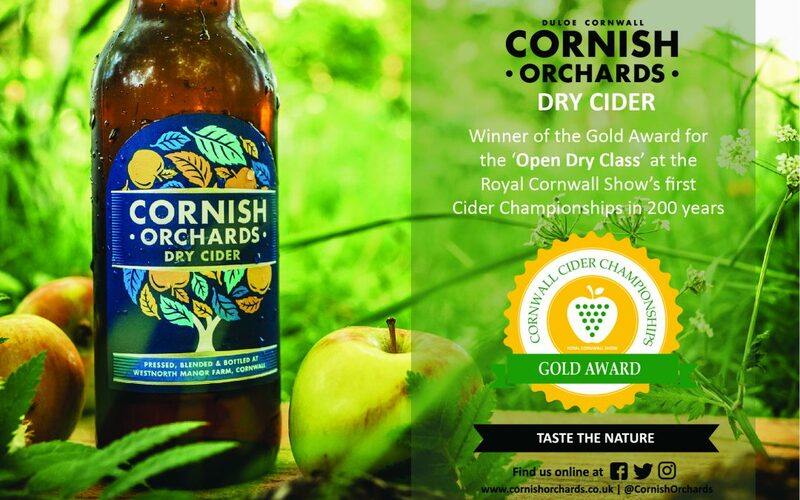 Cornish Orchards Dry Cider was awarded Gold for the ‘Open Dry Class’. Judges on the day included Cider Consultant Bob Chaplin, Chris Coles from Green Valley Cyder Ltd, and Padstow’s very own Celebrity Chef, Paul Ainsworth. Prince Charles even enjoyed a visit to The Dreckly Inn to taste a variety of the ciders that were being judged. This was an important year for Cornish Cider Makers as Cornwall’s rich heritage and long-held tradition in cider making has once again come to the forefront of the industry showcasing the quality in our products and craft.